The LOV-18A-7A consists of the G-Shock AW-590LF-7AV(left) & Baby-G BGA-153LF-7AV(right). Base models are the popular analog-digital AW-591 and BGA-150. 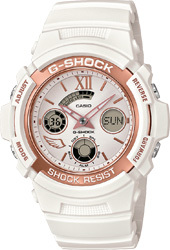 The theme of this year's models is "Love is tough," and this G-SHOCK and BABY-G combination has been designed to express the strong bonds between Cupid and Psyche in never-ending love, despite the many hardships facing them. 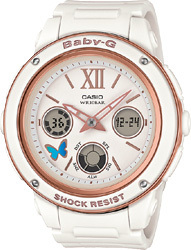 At the 8 o'clock position, the G-SHOCK has a Cupid's wing mark while the BABY-G has a Psyche's butterfly mark to symbolize eternity. The back covers of these models sport a gold ion-plated finish to commemorate G-SHOCK's 35th anniversary, and are stamped with images of an angel and a devil, along with the year 2018. These models come packaged in a red paired model box, which is imprinted with the text G PRESENTS LOVER'S COLLECTION 2018 and a Greek mythology design.